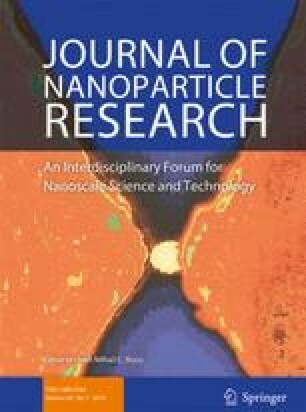 We present a study on the chemical and structural transformations in highly porous monolitic materials consisting of the nanofibrils of aluminum oxyhydroxides (NOA, Al2O3·nH2O) in the temperature range 20–1700 °C. 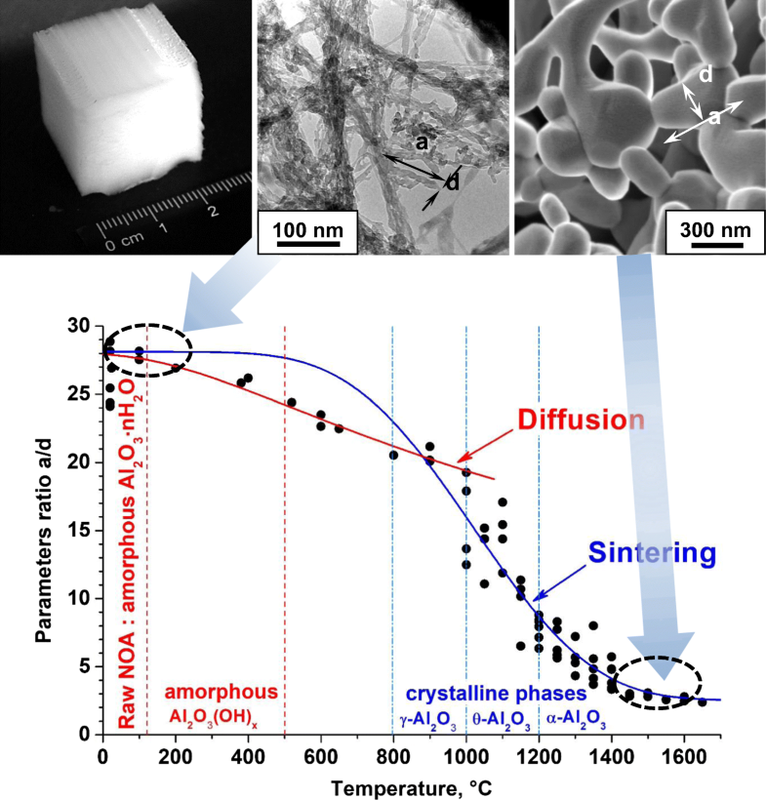 A remarkable property of the NOA material is the preservation of the monolithic state during annealing over the entire temperature range, although the density of the monolith increases from ~0.02 up to ~3 g/cm3, the total porosity decreases from 99.3 to 25% and remains open up to 4 h annealing at the temperature ~1300 °C. The physical parameters of NOA monoliths such as density, porosity, specific area were studied and a simple physical model describing these parameters as the function of the average size of NOA fibrils—the basic element of 3D structure—was proposed. The observed thermally induced changes in composition and structure of NOA were successfully described and two mechanisms of mass transport in NOA materials were revealed. (i) At moderate temperatures (T ≤ 800 °C), the mass transport occurs along a surface of amorphous single fibril, which results in a weak decrease of the length-to-diameter aspect ratio from the initial value ~24 till ~20; the corresponding NOA porosity change is also small: from initial ~99.5 to 98.5%. (ii) At high temperatures (T > 800 °C), the mass transport occurs in the volume of fibrils, that results in changes of fibrils shape to elliptical and strong decrease of the aspect ratio down to ≤ 2; the porosity of NOA decreases to 25%. These two regimes are characterized by activation energies of 28 and 61 kJ/mol respectively, and the transition temperature corresponds to the beginning of γ-phase crystallization at 870 °C. ANR (Agence Nationale de la Recherche) and CGI (Commissariat à l’Investissement d’Avenir) are gratefully acknowledged for their financial support of this work through Labex SEAM (Science and Engineering for Advanced Materials and devices) ANR 11 LABX 086, ANR 11 IDEX 05 02. This work was supported by the French-Russian collaboration project DRI CNRS No. EDC26176, and part of this work was carried out with the financial support of the Russian Foundation for Basic Research (Project 17-53-150007 CNRS_a).